Jordan Spieth believes in God. And if you meet him in person, you’ll quickly realize that, despite his great success, he remains very humble. Last year, Americans fell in love with the 22-year-old golfer hailing from the good ole’ state of Texas. In 2015, Spieth placed first in the Official World Golf Ranking, tied the 72-hole record set by Tiger Woods in 1997, and became the second youngest to win the Masters, behind Woods. He then won the U.S. Open with a final score of 5 under par. To say that Jordan Spieth’s career is something quite remarkable would be the understatement of the century. His winnings last year alone totaled $23 million – not bad for a 22-year-old. But there’s no obnoxious athlete ego here. Spieth is as humble as they come. At only 14-years-old, Spieth dreamed of winning the Masters. Little did he know what an incredible ride it would be — and just how that “dream” would happen 7 years later. According to the pro-golfer‘s website, at age 16, while a high school junior at Jesuit College Preparatory School of Dallas, he was invited to play in the Hewlett-Packard Byron Nelson Championship, and gained national attention when he tied for 16th place. Among other accomplishments as a junior, Jordan was selected to the victorious 2011 Walker Cup team, where, as a 17-year old, he held an undefeated record. Spieth often shares that his 14-year-old sister, Ellie, who has autism, is one of his biggest inspirations. Ellie’s life is what keeps him grounded, and her fearless example is what keeps him going. After every trip, Spieth brings home a keychain, souvenir, or small trinket for his little sister. Spieth is so proud of Ellie, he often invites her on stage with him. To Spieth, people are far more important than golf. Inspired by his sister, Ellie, Jordan fulfilled a lifelong dream by launching the Jordan Spieth Family Foundation. Spieth has made it his personal endeavor to encourage and support underprivileged kids, military families, and children with special needs. Additionally, Spieth is a loyal man. He doesn’t waste his time clubbing or getting drunk. And, unlike most celebrity men, Spieth has remained by his lady — Annie Verret’s side, since high school. We’ve come to find out that Spieth’s girlfriend is much more than just a pretty face. Annie Verret works at The First Tee, a youth development organization that focuses on impacting the lives of young people by providing educational programs that build character, instill life-enhancing values, and promote healthy choices through the game of golf. Perhaps the most inspiring thing about young Spieth, is his love and devotion to his Savior, Jesus Christ. Spieth’s lifestyle shows that the young man is wise beyond his years. To guard himself against the temptations of fame and fortune, Spieth has surrounded himself with like-minded men who love God, like the President and Bubba Watson. 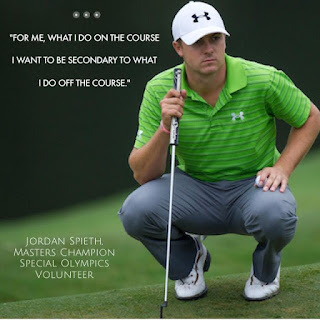 Thank you, Jordan Spieth, for allowing your life to be a living testimony and example! America needs more men of Faith like you!